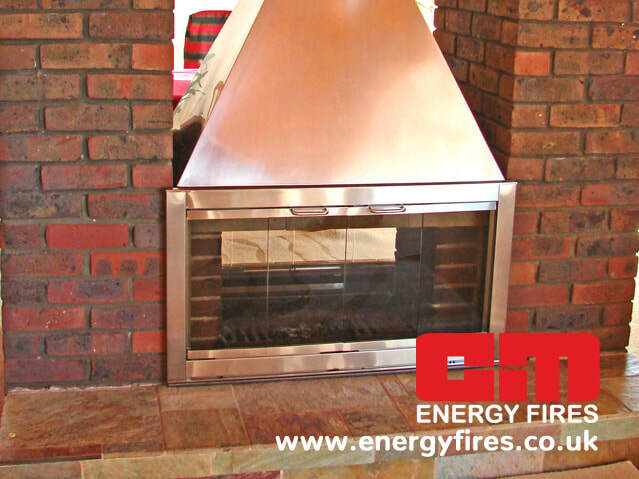 Now you can make your open fireplace safe, clean and more efficient and yet still enjoy a real fire. 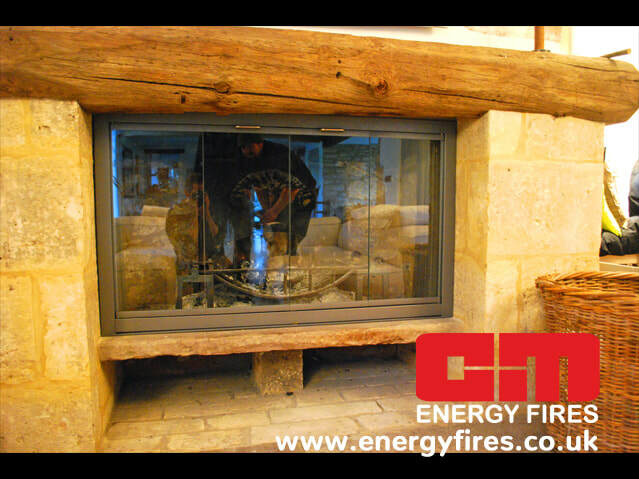 A & M Glass Fireplace Doors are very useful and attractive for what are known as "See-through Fires". These are normally double sided openings between one room and another. Without doors they give problems with cross drafts or smoke emission due to the increased area of opening in relation to the flue capacity. 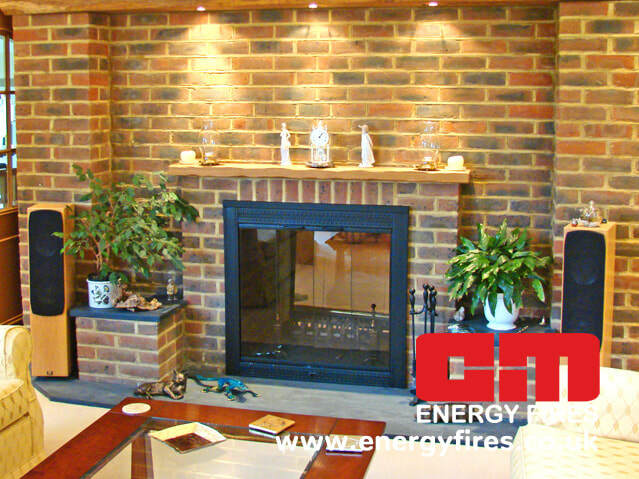 Inevitably double openings lose large amounts of warm household air up chimneys. When single flues are adapted to serve two openings, although very attractive as a feature, there can be a problem of inadequate flue size in proportion to the doubled area of opening. When our doors are fitted the flue capacity is increased by 50%, thereby avoiding a lot of chimney problems, on which we should be happy to advise. 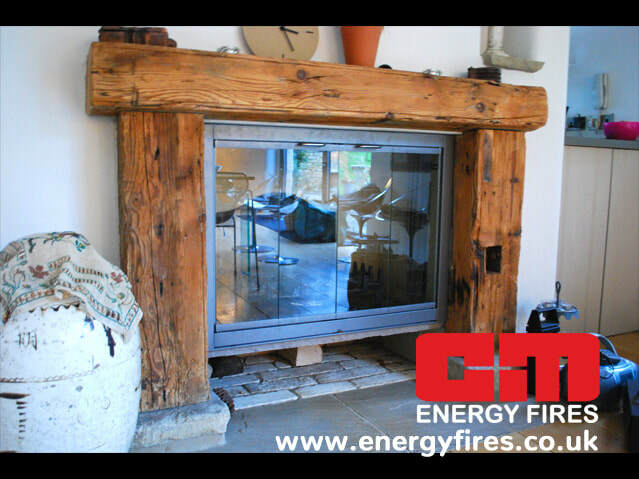 Significant savings in heat losses up the chimney may be obtained by fitting Glass Fireplace Doors over fireplace openings. When you realise that a single open fireplace can be responsible for three or four air changes per hour in a small house, then the savings that may be achieved by fitting such doors are considerable whether or not a fire has been lit. 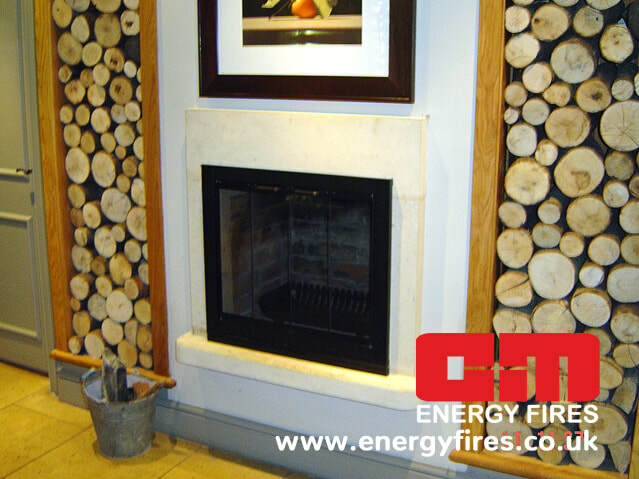 Available in a range of styles and sizes to suit most fireplaces, these doors are easily fitted over the opening in a matter of minutes. They merely require fitting four brackets to the inside cheeks of the fireplace opening. All our doors are made to our specifications here in the U.K. They are all made from 1.5mm stainless steel, laser cut and de-burred before being finished in brushed stainless steel, or powder-coated Satin Black, but again we can meet special requirements. The glass which is guaranteed for three years, is 6mm thick and surface toughened in accordance with BS5 6206A. All four edges are round ground to avoid nicks which could cause glass breakage, and are etched with the relevant BSS No's on their leading edges.